Journalism must become the key vehicle in countering hate speech, xenophobia and propaganda in media and on the Internet. On the occasion of the World Press Freedom Day celebrated on May 3, 2016, the School of Peacemaking and Media Technology in Central Asia encourages the promotion of quality journalism and ethic communications in order to counter modern challenges. In Central Asia, as well as in many other countries around the world, the crisis in the media sphere has been caused by the governmental control, lack of journalism standards, and increasing language of intolerance. Continuous monitoring and studies of media and Internet highlight such trends. Xenophobia and its various types are expressed in open or veiled forms of intolerance in the media environment, which results in the hostility in response, negative impact on the audience, and encouragement of inhumane stereotypes in the society. The negative discourse is promoted by the propaganda, network aggression, and a series of fibs circulated in media and Internet. 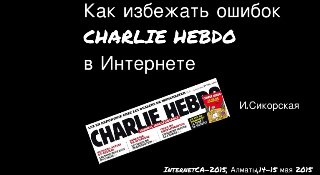 How to Avoid Mistakes "Charlie Hebdo" On the Internet and Decrease Cyber Risks in Central Asia? Reports and master classes about it topics were presented at the Internet Forum by I. Sikorskaya and V.Mamedov, expertsof the School of Peacemaking and Media Technologies. Experts believe that new tools of linguistic, speech, digital security and visual hygiene will help journalists, rights activists and users improve their network communications in the digital age. The study and master classes on linguistic, speech, digital security and visual hygiene were provided byat the 6thannual international forumDevelopment of Internet Sphere in Central Asia InternetCA-2015, which was held May 14-15 in Almaty (Kazakhstan).At the forum were also participated experts from Kazakhstan, Germany, Russia, Ukraine, Bulgaria and the OSCE. The advanced course presented by Peacemakingschool’s experts goes beyond all existing methodologies since it offers the complex approach: from knowledge-based tools to technological skills and development of new network thinking in the digital age. Webinar "Key tools of destroying stereotypes and cliche during reporting conflict" (88 MB) in Russian, trainer- Arif Aliyev, Azerbaijan.